Imagine awe over discovering fantastic vistas in The Last Frontier. Imagine exhilaration whilst exploring the wilds of Alaska. Imagine relaxation upon finding your slice of paradise in The Caribbean. Imagine Bliss. That's what you'll experience when you holiday on our newest and most incredible ship, Norwegian Bliss. Custom-built for the spectacular, Norwegian Bliss features a revolutionary Observation Lounge for you to soak in every stunning moment, from bald eagles soaring over glaciers to dolphins splashing through warm turquoise waters. Come aboard and experience the best dining, entertainment, and amenities at sea against a backdrop of unrivaled natural beauty. Whether you choose to go tropical or a little wild, there’s one word to describe the experiences awaiting you on Norwegian’s newest ship: Bliss. 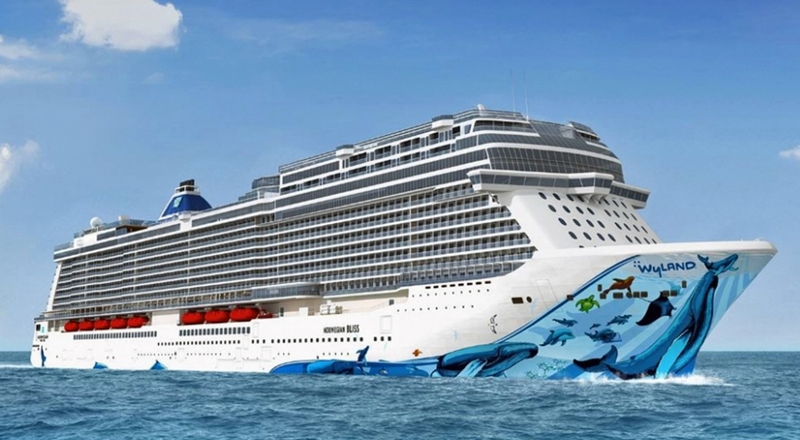 Norwegian Bliss offers a wide range of accommodations designed for the way you cruise. Enjoy splendid luxury in The Haven by Norwegian®. Unpack your family in comfy, connecting staterooms. Relax with an ocean breeze on your private balcony. Take your own adventure in a cozy Studio for solo travelers. Or live it up at sea with our collection of Suites, from well-appointed Spa Suites to spacious two-bedrooms. And no matter which room you choose, you’re always guaranteed a great place to rest. Top off spectacular days with legendary nights aboard Norwegian Bliss. Spend an evening in a swinging speakeasy on the eve of Prohibition. Perfect your dance moves and clear your pipes as you go on an incredible audible journey with The Four Seasons in a Tony Award®-winning musical. Fans of the Beatles shouldn't miss a night rocking out in the famous Liverpool nightclub where the band played. Which will be your soundtrack to an unforgettable night?